If have irritable bowel syndrome, you know its symptoms can include abdominal pain. You might also experience abnormal bowel movements that lead to either diarrhea or constipation. Although the National Institute of Diabetes and Digestive and Kidney Diseases reports that between 10 and 15 percent of adults have IBS, its cause isn't well understood. You can help control the symptoms and possibly lengthen the periods of time you're symptom-free by carefully managing your diet. Soup can be a good choice as part of an IBS diet, but it's important to pick the best types of soup, avoiding those that are high in fat or other potentially aggravating ingredients. If you have IBS, the muscles and nerves in your gastrointestinal tract are extra-reactive to food stimuli, according to the International Foundation for Functional Gastrointestinal Disorders. Because of this, it's important to limit your intake of fat, a nutrient that stimulates intestinal activity. 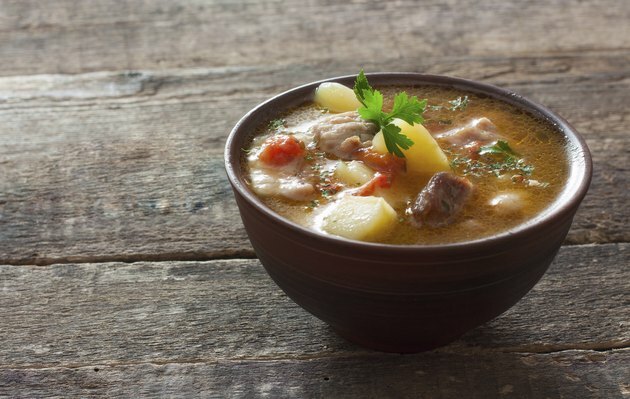 When making meat-containing soup, choose low-fat meats such as chicken or turkey breast, or use low-fat cuts of beef, and trim away all visible fat from the meat before cooking. Avoid recipes with cream or butter and check package labels on prepared soups for fat content; choose products that are fat-free or low-fat whenever possible. Experts at the University of Pittsburgh Medical Center report that most people with IBS benefit from increasing their consumption of dietary fiber, with 20 to 35 grams daily an optimal amount. Adding high-fiber vegetables to soup can help you reach this goal, but cook high-fiber vegetables thoroughly to soften them so they're easier to digest. Add leafy vegetables such as spinach or kale, along with chopped carrots or celery, cooking the soup until testing indicates the vegetables are softened. Also include vegetables and grains high in soluble fiber because this absorbs water to form a gel in your stomach, helping to relieve both constipation and diarrhea. Potatoes and barley are two good examples of foods high in soluble fiber. Drinking plenty of fluids -- at least 8 cups daily -- is an important part of a good diet that can help prevent or relieve IBS symptoms. Soup that contains lots of low-fat or nonfat chicken, beef or vegetable-based broth can help you achieve this goal. For variety, add some whole-grain pasta or brown rice to boost the broth's fiber content and nutrition, while still increasing your fluid intake. Avoid highly spiced or garlicky broths because seasonings such as pepper or chili powder, as well as garlic, can trigger symptoms in some people with IBS. If you have IBS, the International Foundation for Functional Gastrointestinal Disorders suggests you eat more frequent meals, aiming for four to five meals each day rather than three; choosing a cup or two of soup as one of these meals can be a healthy option. When adding any new foods such as fiber-containing or other soup to your diet, do so gradually because foods that trigger symptoms of IBS can vary greatly from person to person. Talk to your doctor or a registered dietitian to develop the best dietary plan for your situation.